On May 12, 1969 star OT Bob Brown of the Philadelphia Eagles came to new GM Pete Retzlaff’s office and demanded to be traded. He was accommodated later that very day. Brown was sent to the Los Angeles Rams along with another disgruntled player, DB Jim Nettles, for OT Joe Carollo, G Don Chuy, and DB Irv Cross. Coach Allen’s enthusiasm seemed appropriate, for the 6’4”, 295-pound Brown was widely considered to be one of the best offensive tackles in the NFL. He had been Philadelphia’s first draft pick in 1964 (second overall) out of Nebraska and the Eagles outbid the AFL’s Denver Broncos for his services. He moved into the starting lineup despite suffering from a tonsil infection that caused him to lose weight. Recovered and up over 290 pounds in ’65, Brown was a consensus first-team All-NFL and Pro Bowl selection for the first of two straight years. Fast and aggressive, he earned the nickname “The Boomer” for his ferocious style of play. Even on passing plays, he was inclined to plow into opposing pass rushers rather than drop back. In the eighth game of the 1967 season, Brown suffered torn tendons in his right knee and was knocked out of action for the rest of the year. It broke a string of 50 straight starts going back to his rookie season. He underwent surgery and his weight dropped to 250 pounds. However, he regained both his weight and his form with the 2-12 Eagles, once again receiving All-Pro and Pro Bowl recognition. Unlike many of the veteran players on the team who actively disliked GM/Head Coach Joe Kuharich, Brown had a great deal of respect for him and, with his ouster following the ’68 season, he determined to leave the club. There were plenty of questions asked in the wake of the trade as to whether the Eagles had adequately filled Brown’s spot on the offensive line. There was certainly no long-term return from the three players that were received. Joe Carollo, a product of Notre Dame, was 6’2” and 252 pounds and had played seven years in the NFL. He had never missed a game with the Rams, was selected to the Pro Bowl in ’68, and appeared in every contest over two seasons with the Eagles before returning to LA. Carollo was consistent, but not nearly as distinguished as the player he replaced at right tackle. The 6’1”, 255-pound Don Chuy was in his sixth season out of Clemson. A native of Nutley, NJ he was capable of playing from either guard position and had expressed a desire to be traded. Chuy had lost his starting job to Tom Mack after injury-plagued seasons in 1966 and ’67. His career came to a premature end during the 1969 season when he suffered a shoulder injury and was then found to have a blood clot in his lung that forced his retirement (he would go on to successfully sue the Eagles after the team physician was reported in the media as saying he had a fatal blood disease). Irv Cross was returning to the club that originally drafted him and for which he had played with distinction for five years, but while Cross had twice been a Pro Bowl performer, he was now nearing the end of his career. It was anticipated that he might even retire to join the new coaching staff, and he was a player/coach in 1969 before becoming exclusively an assistant coach in ’70. 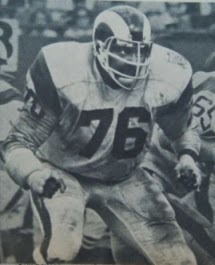 As for Brown, he continued to excel with the Rams. He was a consensus first-team All-NFL selection in both 1969 and ’70 as well as receiving Pro Bowl honors. Los Angeles was a more successful team than the Eagles, winning the Coastal Division with an 11-3 record in ’69 and going a respectable 9-4-1 in 1970. But contract difficulties caused LA to deal the star tackle to the Oakland Raiders after two seasons. Brown made an immediate impression on his new teammates by shattering a wooden training camp goal post with his forearms, and he gained Pro Bowl honors one last time in 1971. However, chronic knee problems became more of an issue. While he made a quick recovery from surgery during the ’71 season, his return to action was probably too quick and he again underwent surgery afterward. Two years later, at age 32, his career was over. It was a notable career, for sure, as he was a first-team All-Pro following five of his ten seasons and gained selection to the Pro Bowl six times. He was eventually inducted into the Pro Football Hall of Fame, Class of 2004. The other player the Eagles sent to LA, Jim Nettles, played four years, appearing at cornerback and safety, and intercepted 16 passes. He was primarily a backup during his time with the Rams.